Anytime we’re stuck inside we wish we had more houseplants to keep us company and make it feel more more lush. Even amateur green thumbs tend to feel this pull to acquire and nurture more plants. In this article we’ve got this quick reference for some of the easiest plants that only require a cutting and some water to make new start. Vines are often very easy to propagate since they love to climb and wander and English ivy is no different. Place cuttings in only a few inches of water in a northern-facing window or indirect sunlight. In a few weeks you should see roots appearing in the water and then you can plant in soil. To propagate in water place leaf with stem into water, standing up with the creative use of wax paper. Use a rubberband to secure a small section of waxpaper over a glass or jar filled with water. Poke holes in the paper for the stem to stand upright in the water. 2-5 weeks later you should have some roots which can be planted in soil. The cutting should be about 5 inches long or so and there should be nodules under the water in the jar or vase since this is where the roots will grow from. The long tendrils of this plant perfectly create lots of babies from which to make water plantings. They only need to be in water for a week or two in order to grow roots. Most succulents are quite easy to start with only water. Succulents need to be dry for a bit for the cutting wound to callus over before being placed into water, though. You’ll want to make sure that at least one nodule or leaf joint is below the water when you propagate zebrina pendula in water. The nice thing about this plant is that its long gangly stems are great for making cuttings from! 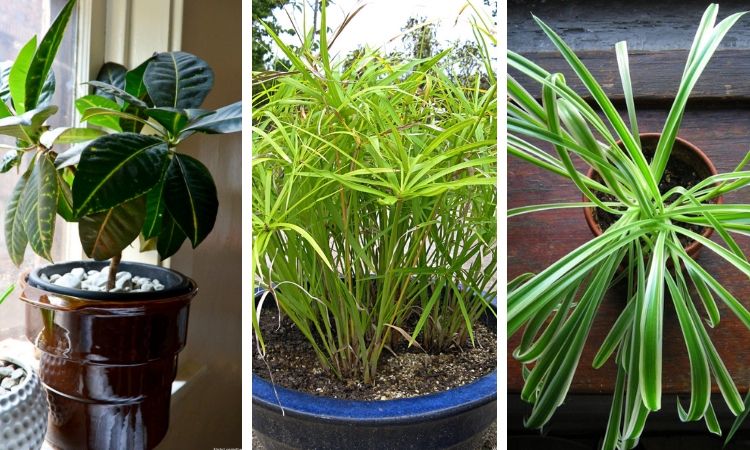 Being a plant that grows in and near water it’s no surprise that papyrus cuttings thrive when placed in water. The trick with these guys is that the head of the cutting goes into the water! Roots develop quite quickly. It takes about 4 weeks for a croton cutting to make new roots. The cutting needs to be 3-6 inches long and have at least 3 leaves.